The biggest benefit of using recycled paper products comes from not having to cut down the trees in our forests to make new paper. 324 liters of water is used to make 1 kilogram of paper. 10 liters of water is needed to make one piece of A4 paper. 93% of paper comes from trees. 50% of the waste of businesses is composed of paper. Packaging makes up 1/3 or more of our trash. Every tree produces enough oxygen for 3 people to breathe. Recycling one ton of paper can save 17 trees, 7,000 gallons of water, 380 gallons of oil, 3.3 cubic yards of landfill space and 4,000 kilowatts of energy-enough to power the average U.S. home for six months-and reduce greenhouse gas emissions by one metric ton of carbon equivalent, reports MTCE. 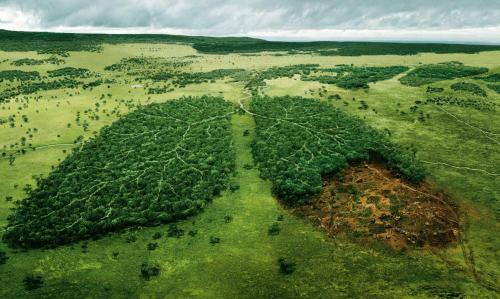 Deforestation is the primary effect of our mindless use of paper. We are only just realizing the wasted use of our trees - trees that give off oxygen and protect the planet from further Global Warming. Paper pollution is another effect of paper waste and it’s a serious problem. It is estimated that by 2020, paper mills will be producing 500,000,000 tons of paper and paperboard each year! We obviously need this product and a reduction of use is not in the horizon. Pulp and paper is the 3rd largest industrial polluter of air, water and soil. Chlorine-based bleaches are used during production which results in toxic materials being released into our water, air and soil. When paper rots, it emits methane gas which is 25 times more toxic than CO2. Essar Foundation has set up a paper recycling unit in Hazira, Gujarat, to utilise the waste paper generated from Essar offices. Every little bit helps to make a difference. Essar Foundation has been working on several green initiatives since its inception. In March 2015, Essar Foundation inaugurated a paper recycling plant in Hazira, Gujarat to recycle the waste paper generated at the Essar offices in the area. The recycled paper is converted into note pads, envelopes and carries bags which are then used by Essar employees. The plant has a monthly production capacity of 2000 sheets, and as of March 2016, the plant has recycled over 1500 kg of paper.